Sephora, the leader in specialty retail and e–commerce, continues to revolutionize the Canadian retail landscape with the launch of a newly optimized Canadian Sephora.ca experience and the opening of a distribution centre. The infrastructure enhancements have been designed to provide a myriad of benefits, including enhanced and expedited shipping standards, elimination of duty fees and mobile check out on the mobile web and Sephora to Go app, to ensure a best-in-class shopping experience. 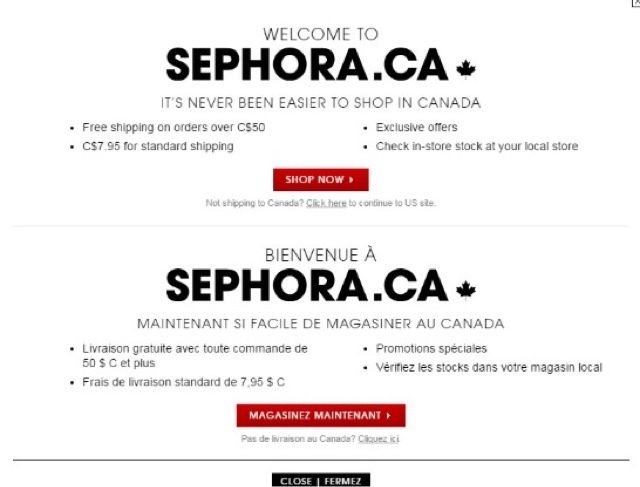 In 2012, Sephora expanded its online beauty presence in Canada by launching sephora.ca, which offered a multi-channel web experience. The new website continues to offer Sephora clients the features she loves, including its unparalleled product assortment and access to the largest beauty community in North America through Beauty Talk, The Sephora Beauty Board, and ratings and reviews, alongside the site's enhancements that enable faster shipping from coast to coast at no additional charge, no duty fees, free returns and free shipping with orders over $50. And launching this September, Canadian clients who shop using the mobile web or Sephora to Go App (iOS or Android) will have full functionality including the new shipping features and check out from their smart phones, for an easy and innovative shopping experience on the go, in store or online. The web enhancements are in part due to the supply-chain infrastructure improvement following the recent opening of the first Canadian distribution centre located in Ontario. The centre, which is 26,012 square meters, employs 82 people and has been instrumental in creating a more seamless client-service experience. "Since Sephora debuted in Canada 11 years ago, we have been relentless on improving our client experience, both in store and online," said Philippe Pinatel, SVP and GM of Sephora Canada. "Sephora has been the progressive leader in the cosmetics landscape, from our exclusive brand offerings and our unbiased and complimentary services at the Beauty Studio to our endless beauty resources online. Our goal in opening our Canadian distribution centre this year was wholly focused on giving our Canadian client an added level of benefit while shopping with us; we wanted to eliminate duties, get products to her faster, and ensure that we are offering her the most resourceful and informative way to shop. By enhancing our mobile web and our checkout perks, we've ensured she's able to maximize her beauty dollars." To celebrate, Sephora will be giving away ten mega sweepstake prizes in late September in time with the launch of mobile checkout. Prize participants include Dior, Make Up For Ever, Nars, Sephora Collection, Urban Decay, and more. Sephora for Canadian shoppers can be accessed by going to www.sephora.ca or www.sephora.com. About SEPHORA Bold, Boundless, addictive – SEPHORA. A revolutionary beauty retailer, SEPHORA has been changing the face of prestige cosmetics since its industry-shaking debut in 1970s Paris. SEPHORA was acquired by leading luxury group LVMH Moët Hennessy Louis Vuitton in 1997 and launched its innovative concept in North America in 1998, where its dynamic, open-sell atmosphere evolved by merging the freedom of experimentation and product discovery with the expertise of personal consultants. Today, stores are home to a curated assortment of 200 world-class brands – including classics, cult favorites, emerging collections and SEPHORA's own private label, SEPHORA COLLECTION – and feature more than 14,000 unique products across makeup, skincare, perfume, haircare, body, professional tools, and more. Powered by SEPHORA University, SEPHORA is the beauty education hub, offering customized consultations at the Beauty Studio, a variety of complimentary classes and one-on-one service from Personal Beauty Advisors, along with exclusive retail technology including SKINCARE IQ, COLOR IQ and Scentsa, resulting in the most expansive educational services in beauty retail. With over 1,780 locations in 29 countries – including 380 in North America with over 56 locations across Canada– SEPHORA is an international force in beauty. Adding to its global retail network, SEPHORA's award-winning website, Sephora.com, and its every-growing presence on Twitter, Facebook and Pinterest, make it the world's premier digital beauty destination. SEPHORA's vibrant, interactive online community, Beauty Talk, amplifies the in-store experience by offering clients exclusive access to personalized beauty advice from The SEPHORA PRO Team and provides a platform for open dialogue with beauty aficionados from around the world.